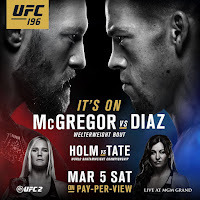 UFC 196 Conor McGregor vs Nate Diaz Fight Pick & Preview | MMA Fighting Events Videos Techniques UFC Fight Picks and News. Connor McGregor is the UFC featherweight (145 lbs) champion. More importantly for those that stand to make money off of this fight, he’s a championship trash talker that knows how to get the fans excited. Nate Diaz is a lightweight (155 lbs) contender in the UFC and his trash talking is nothing to sneeze at. If those two fighting wasn’t interesting enough, these fighters are going to fight in the welterweight (170 lbs) division. 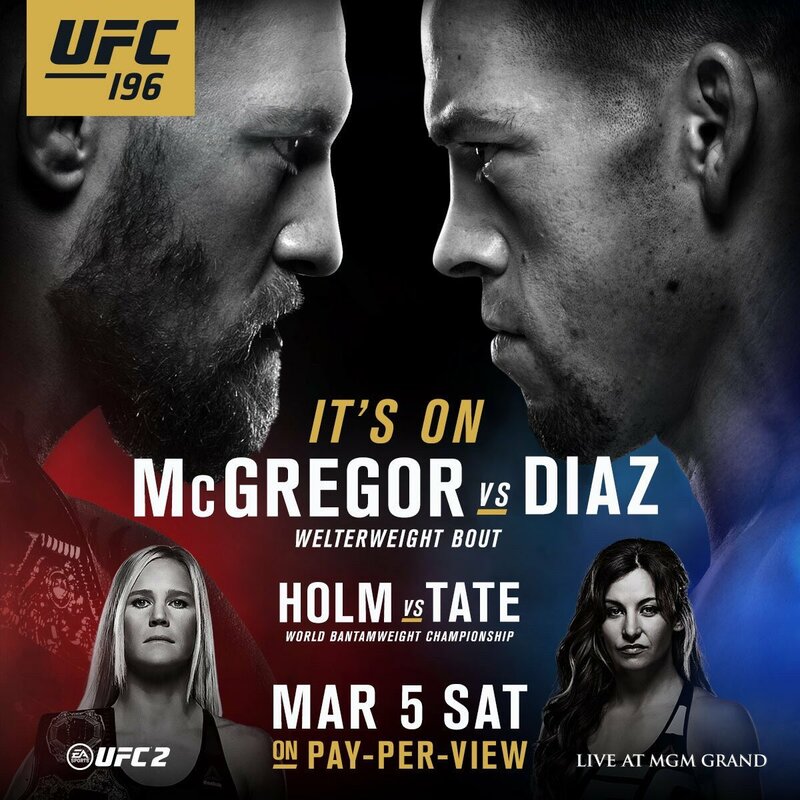 Let’s take a closer look at these fighters and then I’ll make my fight pick for UFC 196: Conor McGregor vs Nate Diaz. Conor McGregor exploded on the scene and quickly made his way into the pound for pound best MMA fighter on Earth debate. He’s 19-2 overall and undefeated at 9-0 in the UFC. The only UFC fighter that has made it out of the Octagon without being stopped via KO or TKO has been Max Halloway. McGregor can handle himself on the ground as well. His ground work was once in question, but he answered the critics when he was taken down by wrestling expert Chad Mendez and took virtually very little damage, made his way back up, and finished Mendez via TKO late in the second round. At this point, there are no known holes in Conor McGregor’s game! Nate Diaz is a UFC veteran. His overall MMA fight record is not all that impressive at 18-10, but don’t let that fool you. Keep in mind that in the UFC, there are no easy fights and you’re always fighting the best of the best. Diaz has some solid wins over high level fighters such as Gray Maynard, Jim Miller and the cowboy Donald Cerrone. Diaz has also made it the distance with current UFC lightweight (155 lbs) champion Rafael dos Anjos (RDA) and former champion Ben Henderson. Diaz is a scrapper. He’s willing to use his volume punching style of boxing to slug it out. But, his ground game is as strong as any MMA fighter and his 11 submission victories have proven that. Diaz has been susceptible to leg kicks but improvement in that area was clearly evident in his dominating performance over highly ranked Michael Johnson. In previous MMA fights, Conor McGregor has been able to get in the head of fighters with his trash talking. Now, he’s facing a fighter that isn’t distracted by trash talking and more likely is actually motivated by it. McGregor will not have a mental advantage in this fight and that’s going to be a feather in Nate Diaz’s hat. Conor McGregor has been fighting in the UFC’s featherweight division versus smaller and shorter fighters. McGregor now faces a man that’s naturally heavier and taller. Nate Diaz will have the advantage with height and weight. Height is normally not a big issue, but reach is. Diaz’s has a 2 inch reach advantage. Nate Diaz doesn’t have a lot of power. This is where McGregor has the clear advantage. McGregor’s power and accuracy is going to be a big problem for Diaz. But, the question will be: Can McGregor get within power striking range? He will at times, but not consistently enough to KO Diaz. If Diaz can make it past the first few rounds, McGregor’s power will begin to diminish as an advantage. Nate Diaz has been battle tested and gone all three rounds several times. He’s also gone five rounds with the former lightweight champion. McGregor has been so good, that he’s only gone three rounds once. If McGregor get dragged into deep waters, his gas tank might be an issue. Diaz will have the advantage. I’m picking Nate Diaz for the win at UFC 196. His length, volume punching, gas tank, and ground game will be the difference. Look for this fight to go into the later rounds, and for Diaz to come out the winner! Who do you think will come out on top at UFC 196?